"Refining Post–Orthognathic Surgery Facial Contour with Computer-Designed/Computer-Manufactured Alloplastic Implants"
"Skeletal Augmentation" and "Subperiosteal Midface Lift"
"Alloplastic Implants for Facial Contouring"
Hazani R, Mrad A, Tauber DM, Ulm J, Yan A and Yaremchuk MJ. Yaremchuk MJ, Gruss JS, Manson PN, editors. Rigid Fixation of the Craniomaxillofacial Skeleton. Yaremchuk MJ, Brumback RJ, Burgess AB. Lower extremity salvage and reconstruction. Orthopaedic and plastic surgical movement. New York: Elsevier Science, 1989. Yan A and Yaremchuk MJ. Yan A and Yaremchuk, MJ. Alloplastic Augmentation of the Facial Skeleton, Chapter 11 in Plastic and Reconstructive Surgery Board Review, third editionLin SJ and Hijawi JB. McGraw Hill, New York, 2016. Yaremchuk, MJ and Vibhakar, D.
Implants and Biomaterials, Chapter 5 in Plastic Surgery Review. Edited by Lakin, GE. Thieme, New York, 2015. Alloplastic Craniofacial Implants. Current Reconstructive Surgery, Serletti et al eds. McGraw – Hill, New York, 2013. Chapter 3. Chapter 15. Midface Skeletal Augmentation and Rejuvenation. Neligan, Ed. Plastic Surgery, Elsevier - Saunders, 2013. 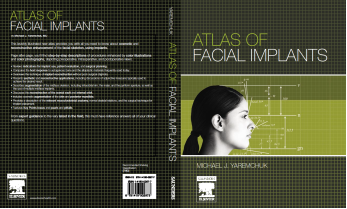 "Midface Rejuvenation" in, Aesthetic Head and Neck Surgery: An Operative Atlas. Edited by Samuel J. Lin, MD and Thomas A. Mustoe, MD. McGraw – Hill, New York, 2013. Doumit G, Schmidek, Yaremchuk MJ. Surgical Management of Major Defects of the Scalp. Schmidek and Sweet Neurosurgical Techniques: Indications, Methods and Techniques, Sixth Edition. Augmentation of the Facial Skeleton. In Plastic Surgery Secrets Plus. Second Edition, Mosby-Elsevier, 2010. Alloplastic augmentation to improve blepharoplasty and midfacial results. Techniques in Aesthetic Plastic Surgery – MIDFACE SURGERY, Ed. Claudio Cardoso de Castro MD and Kristin A. Boehm MD, ASPS, FACS, Elsevier Limited, 2009. Plastic Surgery. 2nd edition Mathes SJ, Ed. Elsevier Saunders, Philadelphia. 2006, 546-606. Augmentation of the Facial Skeleton. Plastic Surgery. 2nd edition Mathes SJ. Second Edition, Mosby-Elsevier, 2006. Evaluation and Management of Chronic Naso-Orbito-Ethmoid Fractures. Evaluation and Treatment of Orbital Fractures. Holck, DEE and Ng, JD., Eds. Elsevier Saunders, Philadelphia, 2006. Facial skeletal augmentation with implants. Grabb and Smith's Plastic Surgery 6th edition, Thorne CH, Ed. Lippincott, Williams, and Wilkins. 2006. Repair, Grafting and Engineering of Cartilage. Plastic Surgery. 2nd edition Mathes SJ, Ed. Elsevier Saunders, Philadelphia. 2006, 621-638. Demartelaere, SI, Shore J, and Yaremchuk, MJ. Late Management of Orbital Deformities. In Albert and Jacobiec"s Principles and Practice of Ophthalmology. Albert and Miller, Eds. Elsevier-Saunders, 2006. Peled ZP, Warren SM and Yaremchuk, MJ. Rhinoplasty. In Practical Plastic Surgery. Kryger ZB and Sisco, M Eds. Landes Bioscience, 2006. Simulating Facial Skeletal Osteotomies with Alloplastic Implants. In Three Dimensional Facial Sculpting Terino, EO, Ed. Marcel Dekker, 2006. Surgical repair of major defects of the scalp and skull. Indications, Methods, and Results. 5th edition 2005. Tissue Engineering and Biomaterials. In Handbook of Plastic Surgery. Greer SE, Benhaim P, Lorenz, HP, Chang, J, and Hedrick, MH, Eds, Marcel Dekker, New York, 2004. Engineering Tissues for Face and Facial Skeleton. In: Posnick JC, editor. Reconstruction of Craniofacial Deformities in Children and Young Adults. Philadelphia: WB Saunders; 2004. The Effects of Plate and Screw Fixation on Growing Craniofacial Skeleton. In:Greenberg AU, Prein JM, Editors. Craniomaxillofacial Bone Surgery: Advanced Principles Using The AO/ASIF Technique. New York: Springer-Verlag; 2002, 693-699. Biomaterials (Excluding Breast Implants and Expanders). The Unfavorable Result in Plastic Surgery; Avoidance and Treatment. Philadelphia: Lippincott Williams& Wilkins; 2001. p. 173. Late Management of Orbital Deformities. In Albert DM, Jackobiec FA, Editors, Principles and Practices of Opthalmology, Second Edition. Philadelphia: WB Sanders; 2000 p. 5311. Yaremchuk MJ, Gallico GG III. Principles and Practice of Plastic Surgery. Oxford Textbook of Surgery, Second Edition, Oxford: Oxford University Press; 2000. p. 3533. Opthalmology, Second Edition. Philadelphia: WB Sanders; 2000 p. 5291. Yaremchuk MJ and Rubin JP. Surgical Repair of Major Defects of the Scalp and Skull. In: Operative Neurosurgical Techniques. Schnidek HH, et al. Fourth Edition. Philadelphia: WB Saunders; 2000, p 3. Correction of Post-Traumatic Enophthalmos. In: Toth B. Keating RF, Stewart WB, Editors. Atlas of Orbitocranial Surgery. London: Martin Dunitz; 1999. Surgical Repair of Major Defects of the Scalp and Skull. In: Schmidek H, Sweet W, Editors. Operative Neurosurgical Techniques. Philadelphia: WB Saunders; 1995. p. 13-26. Fractures of the Maxilla. In: Cohen M, Editor. Master of Surgery: Plastic and Reconstructive Surgery. Boston: Little, Brown;1994. p. 1156. Plastic Surgery Principles and Practice. In: Morris PJ, Malt FA, Editors. Oxford Textbook of Surgery. Oxford: Oxford University Press; 1994. p. 2663. Reconstruction of the Internal Orbit Using Rigid Fixation Techniques. In: Yaremchuk MJ, Gruss JS, Manson PN, Editors. Rigid Fixation of the Craniomaxillofacial Skeleton. Boston: Butterworth-Heinemann; 1992. p. 317-322. Rigid Fixation of Frontal Bone Fractures. In: Yaremchuk MJ, Gruss JS, Manson PN, Editors. Rigid Fixation of the Craniomaxillofacial Skeleton. Boston: Butterworth-Heinemann; 1992. p. 323-329. Markowitz BL, Manson PN, Yaremchuk MJ. Rigid Fixation of Panfacial Injuries. In: Yaremchuk MJ, Gruss JS, Manson PN, Editors. Rigid Fixation of the Craniomaxillofacial Skeleton. Boston: Butterworth-Heinemann; 1992. p. 330-337. Rigid Internal Fixation of Mandibular Fractures. In: Yaremchuk MJ, Gruss JS, Manson PN, Editors. Rigid Fixation of the Craniomaxillofacial Skeleton. Boston: Butterworth-Heinemann; 1992. p. 179-186. The AO/ASIF Maxillofacial Implant System. In: Yaremchuk MJ, Gruss JS, Manson PN, Editors. Rigid Fixation of the Craniomaxillofacial Skeleton. Boston: Butterworth-Heinemann; 1992. p. 124-133. Treatment of Complex Midfacial Injuries. In: Russell RC, Editor. Plastic Surgery Educational Foundation Instructional Courses, Vol. 3. St. Louis: Mosby Year Book; 1991. p. 171-204. The Role of Free Tissue Transfer in the Reconstruction of the Traumatized Lower Extremity. In: Border JR, Editor. Blunt Multiple Trauma: Comprehensive Pathophysiology and Care. New York: Marcel Dekker; 1990. p. 671-690. Acute Flap Coverage of Open Lower Extremity Fractures. In: Marsh JL, Editor. Current Therapy in Reconstructive Surgery. Philadelphia: BC Decker; 1988. Management of Traumatic Osteocutaneous Defects in the Lower Extremity. In: Evarts MC, Editor. Surgery of the Musculoskeletal System. Section XIII Infection. New York: Churchill Livingstone; 1988. p. 4525-4555. Manson PN, Yaremchuk MJ, Hoopes JE. Soft Tissue Injuries of the Extremities. In: Zuidema GD, Ballinger WF, Rutherford RB, Editors. Management of Trauma. Philadelphia: WB Saunders; 1985. Vibhakar D, Dayan E, and Yaremchuk MJ. Indications and Techniques for Bridge of Bone Canthopexy in Aesthetic Surgery of the Face - Operative Techniques in Plastic Surgery, Thorne Ch. Ed. Wolters Kluwer. Aesthetic Surgery of the Face - Indications and techniques for palatal spacer grafts in Aesthetic Surgery of the Face -Operative Techniques in Plastic Surgery , Thorne C. Ed. Wolters Kluwer. Dayan E, Vibhakar D and Yaremchuk MJ. Indications and Techniques for Malar Implants in Aesthetic Surgery of the Face-Operative Techniques in Plastic Surgery, Thorne C. Ed. Wolters Kluwer. Lowering the Over Elevated Brow in Aesthetic Surgery of the Face - Operative Techniques in Plastic Surgery, Thorne Ch. Ed. Wolters Kluwer. Indications and Techniques for Mandibular Implants in Aesthetic Plastic Surgery Operative Techniques in Plastic Surgery, Thorne C. Ed. Wolters Kluwer. Lee J, Gordon C and Yaremchuk MJ. Commentary on: The Influence of Paranasal Augmentation of the Measurement of the Nose for the Treatment of Midfacial Concavity. Commentary on: Chin Ups and Downs: Avoiding Bad Results in Chin Reoperation. Aesthetic surgery Journal 2017; Vol37 (3) 264-265. Commentary on: Reduction Malarplasty that use Malar Setback without Resection of Malar Body Strip. Aesthetic Plastic Surgery, 41 (5), 1167. 2017. Commentary on: Alloplastic Augmentation of the Asian Face: A Review of 215 Patients. Aesthetic Surgery Journal 2016; Vol 36(8) 869-871. Commentary on: The Role of Microfat Grafting in Facial Contouring. Aesthetic Surgery Journal 2015;10.1093. Doumit G. Abouhassan W and Yaremchuk, MJ. Aesthetic Refinements in the Treatment of Graves Ophthalmopathy. Plastic Reconstructive Surgery, 134:519-526,2014. Doumit G, Gharb BB, Rampazzo A, McBride J, Papay F, Zins J and Yaremchuk,MJ. Surgical Anatomy Relevant to the Transpalpebral Subperiosteal Elevation of the Midface. Aesthetic Surgery J: 2014,1-6. Hazani, R, Rao A, Ford R, Yaremchuk, MJ, Wilhelmi BJ. The Safe Zone for Placement of Chin Implants. Plastic & Reconstructive Surgery. 131: 869, 2013. Raschke R, Hazani R, Yaremchuk MJ. Lefkowitz T, Hazani R, Chowdry S, Elston J, Yaremchuk MJ, Wilhelmi BJ. Gordon CR, Susarla SM, Peacock ZS, Kaban LB and Yaremchuk MJ. Le Fort-based maxillofacial transplantation: current state of the art and a refined technique using orthognathic applications. Journal of Craniofacial Surgery 2012; 23: 81-87. Hazani, R and Yaremchuk, MJ. Correction of Posttraumatic Enophthalmos. Archives of Plastic Surgery 2012; 39; 11-17. Temporal Augmentation with Methyl Methacrylate. Aesthetic Surgery Journal, 31(7)827-833, 2011. Alloplastic Augmentation of the Facial Skeleton: An Occasional Adjunct or Alternative to Orthognathic Surgery. Plastic and Reconstructive Surgery, 127;2021-2030, 2011. Plastic and Reconstructive Surgery, 127:374-383, 2011. Bridge of Bone Canthopexy. Aesthetic Surgery Journal, 29:323-329, 2009. Matros E, Garcia JA, Yaremchuk,MJ. Changes in eyebrow shape and position with aging. Plastic and Reconstructive Surgery, 124:1296-1301, 2009. Periorbital skeletal augmentation to improve blepharoplasty and midfacial results. Plastic and Reconstructive Surgery, 124: 2151-60. Thomas MA and Yaremchuk MJ. Masseter muscle reattachment after mandibular angle surgery. Aesthetic Surgery Journal, 29:473-76. The Aging Midfacial Skeleton: Implications for Rejuvenation and Reconstruction using Implants. Facial Plastic Surgery 25:252-59,2009. Secondary Malar implant Surgery. Plastic Reconstructive Surgery 121:620-628,2008. Reversing Browlifts. Aesthetic Surgery Journal.27:367-375, 2007. Enlarging the Deficient Mandible. Aesthetic Surgery Journal. 27: 539-550, 2007. Making the concave midface convex. Aesthetic Plastic Surgery. 2005, 29:141-148. Improving periorbital appearance in the "morphologically prone". Plastic and Reconstructive Surgery. 2005, 114(4);980. Ganchi PA, Movassaghi K, Yaremchuk MJ. Treatment of bilateral symptomatic enophthalmos associated with weight loss. Journal of Craniofacial Surgery. 2004 Jan;15(1):84-7. Facial skeletal reconstruction using porous polyethylene implants. Plastic and Reconstructive Surgery. 2003 May;111(6):1818-27. Restoring palpebral fissure shape after previous lower blepharoplasty. Plastic and Reconstructive Surgery. 2003 Jan;111(1):441-507. Infraorbital rim augmentation. Plastic and Reconstructive Surgery. 2001 May; 107(6):1585-92. Subperiosteal and full-thickness skin rhytidectomy. Plastic and Reconstructive Surgery. 2001 Apr 1;107(4):1045-58. Mandibular augmentation. Plastic and Reconstructive Surgery 2000. Sep;106(3):697-706. Orbital deformity after craniofacial fracture repair: avoidance and treatment. Journal of Craniomaxillofacial Trauma. 1999 Summer;5(2):7-16. Paranasal implants — correcting midface concavity. Plastic and Reconstructive Surgery. 1998; 102:1676-1684. Choi JC, Sims CD, Casanova R, Shore JW, Yaremchuk MJ. Porous polyethylene implant for orbital wall reconstruction. Journal of Craniomaxillofacial Trauma. 1995 Fall;1(3):42-9.